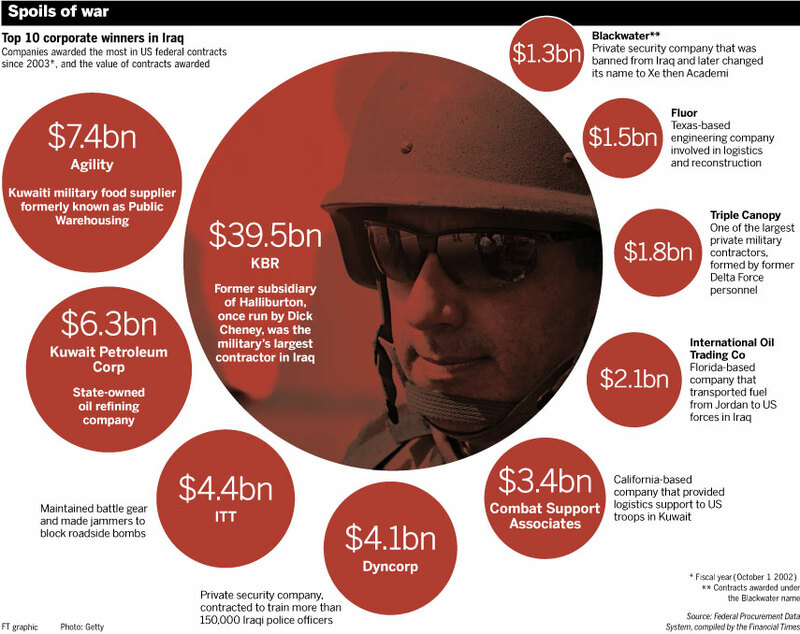 Financial Times Graphic, Iraq War 2003-2013. This semester I am teaching a foundational Masters level course for our Masters of Public and International Affairs degree in the National Capital Region, Power and Policy in the United States. The course is a new preparation for me. The topic is enormous and there were many different ways in which I could have structured the course. In the end I choose to address the established and largely Sociology-based literature on ‘power structure’ research in the United States, a few aspects of the debate over the nature of the post-war US state and foreign policy making, and then use one specific policy question to bring the various themes and literatures together. The question I choose to focus our attention on was the following: why did the United States go to war against Iraq in 2003 (thus the attached graphic). Comments are welcome. It should be an interesting semester. This entry was posted in Congress, Constitution, Current affairs, Democracy, Dirty Wars, drones, George Bush, Israel, Jeremy Scahill, Obama, political system, special interests, state theory, Washington D.C.. Bookmark the permalink. Rise of the Vulcans may be a good book to point students to. Yes, thanks Vladimir. I’ve used this in the past in my American Foreign Policy class, as well as Mann’s latest, The Obamians. The ‘cabal theory’ of the Iraq war centered on neoconservatives misses, I think, the larger geopolitical culture and geopolitical economy within which decisions were made. This is my contention, too, in the US-Georgia research.